Humic Acid Market size was recorded at over USD 400 million in 2016 and will witness growth at a CAGR above 12%. Rapidly growing global population and their nutritional demand decreased the arable land ratio to less than 0.2 hectares for a single person by 2013. As per a WHO report, world agricultural yield must be increased by at least 50% per hectare to meet the growing demand for food. By the end of 2030, global food demand will rise by 35% and majority of this demand must be met by increasing crop yield. 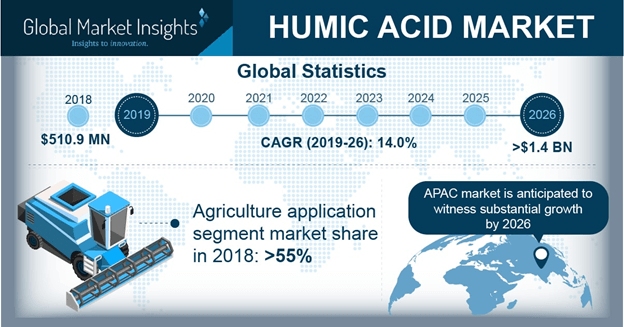 Increasing product usage to provide adequate nutritional value to the agricultural land in order to promote sustainable farming will propel the global humic acid market in coming years. The product tends to improve the soil texture and water retention properties and promotes bio-activity of the soil to make it more fertile and productive. The shift of focus of agriculturists around the globe towards improving the soil productivity to mitigate crop losses and enhance agricultural outputs will positively influence the humic acid market demand. Growing demand for organic food products will further enhance the global humic acid market in coming years. Farmers in the developed economies are gradually shifting towards organic farming and according to the Organic Trade Association (OTA) of the U.S., the organic food products sales reached close to USD 40 billion in 2015. This changing agricultural trend towards organic farming owing to rising awareness and increasing affordability of the population of developed countries will boost the overall humic acid market in the upcoming years. Inconsistency in the product quality available under different commercial brand names may pose threats to the overall humic acid market growth in coming years. Studies reveal a significant variation in the sorption coefficients of the same substance based on the source of the humic material by a factor of ten. Lack of quality control by governing bodies based on their lignite sources, and other qualitative properties may decrease the humic acid market popularity among organic farmers throughout the globe. Humic acid market has been segmented on the basis of application into agriculture, horticulture, ecological bioremediation, dietary supplements, and others including medicines, vertical farms, and residential gardening to name a few. Rising trend of organic farming in response to the health and ecological disadvantages of conventional chemicals used for agriculture will make it a notable segment. The agriculture application segment accounted for more than half of the global humic acid market share in 2016 and will exhibit a promising growth at over 12.5% CAGR in the forecast years. Government initiatives and subsidiaries to promote organic farming in several countries throughout the world will further boost the market growth. Rising awareness pertaining to the health benefits of the product will likely influence the dietary supplements application segment of the humic acid market in coming years. This segment generated revenue more than USD 50 million for the overall humic acid market in 2016 and will exhibit growth at a substantial rate. It is gaining popularity for stimulating the human immune system and for detoxification of the human body. Mineral rich content of the product also helps to tackle diseases such as influenza and common cold. North America humic acid market garnered a significant share of the overall industry with revenue more than USD 150 million in 2016. With growing demand for organic products in the U.S. and Canada, the region will witness a significant growth in the market in coming years. More than 80% households of the U.S. indulge into the purchase of organic products at present and this number will likely increase with increasing purchase power and awareness of the population. Asia Pacific humic acid market accounted for a minor share of less than a fifth of the total industry owing to less popularity of organic farming in the region. The market will witness growth at close to 13.5% CAGR owing to rapid development of the region and fast growing GDP. Rising number of middle and high income group families in the region will have a positive influence on the organic food industry, hence propelling the overall market. According to Organic Farming Association of India (OFAI), total land under organic farming will grow about three times in the next three years, reaching up to 2 million hectares by 2020. Global humic acid market competitive landscape is characterized by the presence of several large, medium and small scale industry participants throughout the world. Most companies are located in North America and Europe to cater the growing demand from the organic farming industry in the developed nations. The companies invest in extensive R&D works to develop their portfolio and meet specific customer demands. Some of the important humic acid market players include Humintech GmbH, The Andersons, Inc., Black Earth Humic LP, NPK Industries, Faust Bio-Agricultural Services, Biolchim, Agriculture Solutions, Humic Growth Solutions, Nutri-Tech Solutions, Nature's Lawn & Garden., Tagrow, Grow More Inc., WinField Solutions, Organic Approach, Wilbur-Ellis Company, National Pesticides & Chemicals, Jiloca Industrial, Saint Humic Acid, and Sikko Industries Ltd.
Humic acid market is directly dependent on the growing popularity of organic farming industry and increasing usage of organic minerals in horticulture and ecological remediation. Adverse environmental and health effects of chemical fertilizers induce the product demand. Industry participants are concentrated in the developed countries to meet the continuously increasing local demand. Rising trend towards sustainable and organic cultivation in the developing regions has led to establishment of several medium and large scale companies in countries such as China and India.